Firstly i want to say that this is so unlike anything I ever thought I’d do - I don’t like to ask for help! But, things have got desperate and I am willing to do anything to stay with my family as long as I possibly can. My name is Nikki and I am 42 years old. In 2017 (3 months after losing my mum to a very short battle with cancer) I was diagnosed with Triple Negative Breast Cancer. I was completely floored as it was such a shock. I went through 6 rounds of chemo, surgery to remove breast tissue and all my axillary lymph nodes and 20 sessions of radiotherapy. At the end of all that I was told that I had had a complete response to the chemo and, as far as they could tell, all traces of the cancer were removed from my body. Unfortunately, Triple Negative Breast Cancer is aggressive and very, very sneaky. Less than a year after finishing treatment I started to get unwell - first with deafness in my right ear, then with facial palsy on my right side (diagnosed at first as Bell’s Palsy) and then with severe pains in my left side. None of the doctors I saw seemed concerned that any of my symptoms were related to my previous cancer, but I knew - I just knew - they were. After insisting on a CT scan, the awful news came back that the cancer had indeed returned and it had spread. Firstly to my kidney (this is highly unusual and not somewhere breast cancer usually spreads to), also to my liver and a further brain MRI showed that it had also settled in my brain lining around my auditory and facial nerves (explaining the deafness and facial palsy). The hospital told me that I am the first patient they have seen who has metastatic breast cancer spread to the facial nerves! I always knew I was unique but this takes the prize! 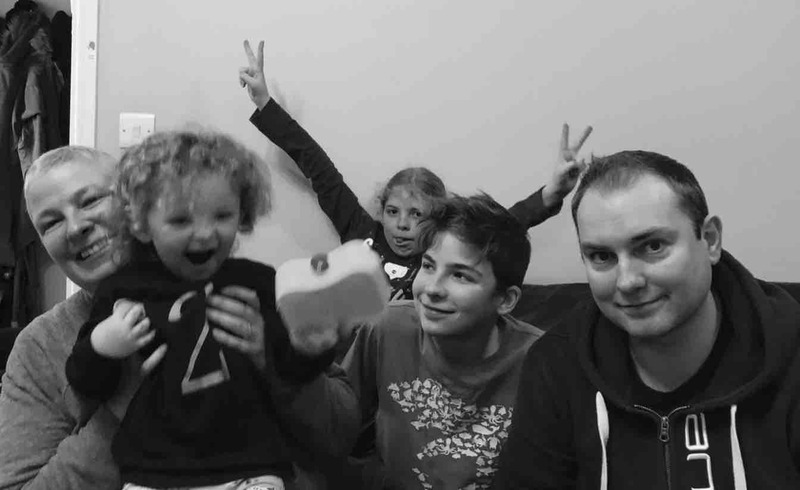 Now to my reason for raising money - my family are my absolute world. I have an amazing husband who supports me every single day and attends every appointment with me. He is truly my knight-in-shining-armour. Together we have 3 children ranging in ages from 15 down to 2. My children are my everything. The thought of leaving them is not one I am prepared to face at the moment. My 15 year old is going through his GCSEs and is set to do brilliantly and I don’t want to cause any additional worries in his life. My 9 year old will soon be going through puberty and will need her mummy to be by her side and guide her. One of my biggest fears is that, if I die soon, my 2 year old will have no memories of me - that breaks my heart. As I mentioned before, Triple Negative Breast Cancer is aggressive and unpredictable and there are currently no targeted treatments for it. The only thing I can be offered on the NHS is chemotherapy (which I have already started) but it will only ever buy me a little extra time. Immunotherapy looks like it is the best treatment currently available but is only offered through trials in the U.K. I am not in a position to be entered into the trials at the moment due to the cancer in my brain lining. It is, however, available privately and also in other countries, if I am eligible. 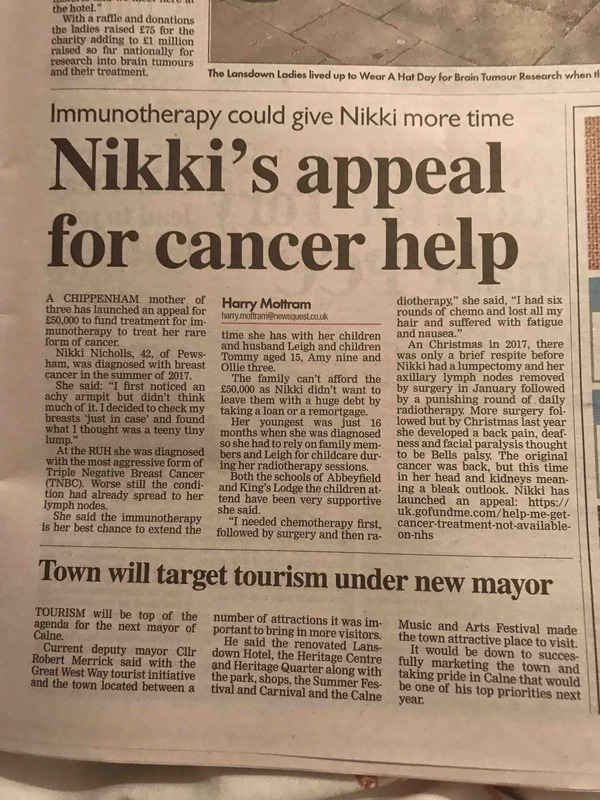 My hope is to raise enough money to allow me to receive immunotherapy or alternative treatments not available to me on the NHS which will, hopefully, give me some more time with my family. I am under no illusions - I know that this cancer will kill me, but I just need more time. Time for me to make memories with my children and time for me to make peace with the fact that my life will not turn out the way I had hoped and planned. 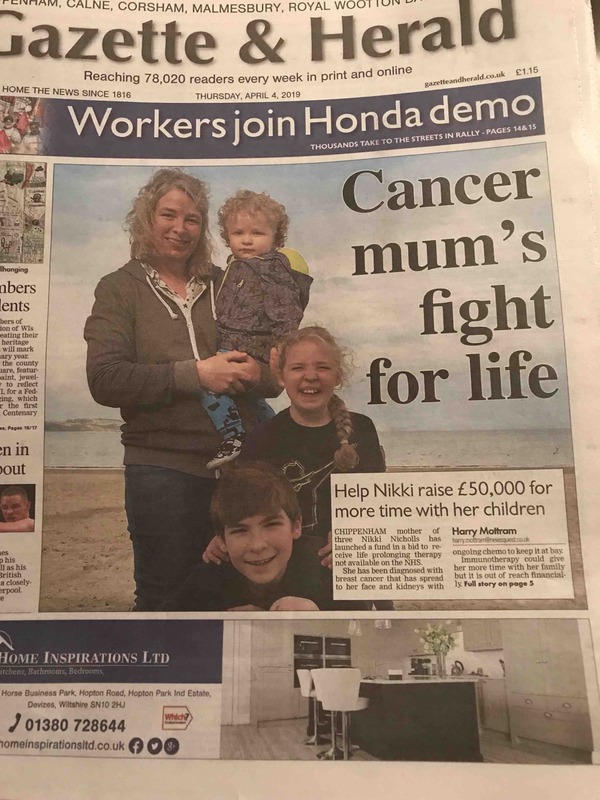 If the worst happens before I can raise enough money or if the situation changes in the meantime, I would like any money raised to go to my children - I have nothing of any value to leave them and will never be in a position to leave them any money for their futures, so this can be my final gift to them. Any help at all will be so appreciated. I know it’s a big ask as there are so many people needing help these days and I am so very grateful to anyone who reads my story - if you can’t help, please share my info so maybe someone else can. So... I’m finally a cover girl!! Not the story I wish I could be telling but hopefully it will get me, and metastatic cancer, more coverage and get the story out there! It was hard to read it in black and white, even though I’m living it every day - it somehow makes it more ‘real’!